With its charming and inviting atmosphere, innovative menu and extensive wine list, 843 is the place to go. The Ancient Grain Salad and variety of seafood are favorites and the chocolate pot de crème are a decadent delight. Situated in a cottage style garden, with indoor/outdoor seating. We’re located in the Fresh Market Shoppes. Visit us at www.843via808.com or call 843-681-8843..
On a picturesque lagoon in Palmetto Dunes, Alexander's has been an island tradition since 1977. At Alexander's, one of the sought after Hilton Head restaurants, you can choose from over 100 hand selected wines to compliment the freshest seafood and hand trimmed steaks and enjoy the vintage Harley Davidson collection. Aunt Chilada's, located on Hilton Head Island for 13 years, genuinely serves something for everybody. In addition to a broad range of traditional "American" fare, it also served excellent Hilton Head seafood, Mexican and Tex-Mex cuisine, great steaks, all you can eat crablegs and more. Great kid's menu and an excellent place for take-out! One of the Island's best happy hours. Aunt Chilada's is open for lunch and dinner. Locals are flocking to the tiny waterfront cafe to enjoy a fresh new spin on island dining. With both indoor and outdoor seating, patrons are finding a unique blend of casual elegance, reminiscent of a Paris bistro. "There's not another restaurant like it on the island," said Jim, touting the combination of distinctive cuisine and magnificent setting. Bistro 17 serves breakfast from 8:30 - 11, Lunch from 11 - 5 and Dinner from 5 - 10. Partly because of its location beside a marshy inland channel, a few steps from the most battered-looking boatyard and marina on Hilton Head Island, this is the most raffish of the "grand cuisine" restaurants of Hilton Head. Fun, with lots of salty cosmopolitan charm, and an insouciance that might remind you of Key West, it seems a world removed from the manicured, upscale conservatism of the island's secluded residential zones. Hello and welcome to Bonefish Grill - Hilton Head Island! Our anglers are here to ensure your Bonefish Grill experience is outstanding each and every time you visit. In here, the specials don't stop at the food. Here, special is the feel of a big city bar that's not far from home. It's a wood-burning grill that swaps out boredom and routine for a dinner that opens your eyes. It's chef-coat service that's not about being stuffy, but all about knowing what you need. It's feeling good about the food, the people and the bill each time you walk through the door. Our coffee shop has an exciting and laidback environment to enjoy our creations of creamy gelato, fresh locally baked pastries, and brewed specialty coffees. C’est Bon, a new and unique cafe in Sea Pines on Hilton Head Island, is proud to provide Hilton Head residents and visitors with an environment that fuses elegance with relaxation. . The famous Charley's Crab is now one of 27 renowned Chart House Restaurants. At Chart House you will enjoy our new vibrant decor, top-of-the-catch seafood, succulent steaks and decadent desserts while overlooking the Intracoastal Waterway. Nestled amidst the ancient, moss draped oaks in Harbour Town, CQ's combines great fun, fine dining and a touch of Hilton Head Island history. CQ's has the feeling of an old, cozy, and comfortable inn. Heart of pine floors, wooden mantle pieces, stained glass, and the photographs and memorabilia of the Lowcountry culture all contribute to the charm that has made CQ's the place to dine since 1973. Crane's Tavern Steakhouse & Seafood is a great destination for steak and seafood lovers, where numerous cuts of only USDA Prime Grade Beef, including their "Famous Prime Rib". Recipient of Wine Spectator magazine's "Award of Excellence" for their selection and knowledge of wine! everything from dressings to desserts that can be is "homemade." Crane's Tavern represents a hundred year old Crane family restaurant tradition. It is reminiscent of "Old Philadelphia", with its antique heart of pine floors, a custom designed Old English Bar, hand crafted etching, black and white photographs and Windsor chairs. A classic American-Italian Restaurant & Lounge. An atmosphere fondly reminiscent of times past... but never forgotten. An experience to be shared with family and friends. Frankie Bones Lounge is open until Midnight with Nightly Specials after 9pm. A walk through the door into The Fabulous Frankie Bones Restaurant & Lounge takes you back to the carefree style of the early 1960's and its restaurants in the big cities across America. At Frankie Bones, snappy sounds, high back burgundy leather booths, an award-winning menu and first class service are the recipe for an experience to remember. Breakfast, Lunch and Afternoon Tea/ Coffee can be enjoyed inside in the charming cafe or outside in the courtyard where you can enjoy Pineland's beautiful gardens and look beyond to the waterwheel in the pond out back. For breakfast or a mid-day break, enjoy a Cappacino or Latte with a fresh baked pastry. For lunch, enjoy hot and cold sandwiches made on fresh baked breads and crusty baguettes as well as soups, salads and quiche. Just relaxing in the courtyard with a cappuccino is enough to evoke those fond memories of past European visits! Even if you can't stay for awhile, call us to prepare your Take-out order. For more than 20 years we've been living out our passion for food by serving up the freshest pizza, pasta, and hoagies in a neighborhood atmosphere like the ones we knew in Pittsburgh. Whether you want to bring the whole neighborhood in, or bring Giuseppi's home to the whole neighborhood, we have just what you need. From Original Products like our Homemade ToGo, catering for parties and events at your place, or dinner for the whole family at our place, we have the menu and the atmosphere you've been looking for. HH Prime serves the finest of USDA Prime aged steaks. Our steaks are hand selected from the top 2% of all US Beef and dry aged 14-21 days. HH Prime was designed to offer the best steaks on Hilton Head Island, rivaling national chains, Ruth's Chris, Morton's and other top steakhouses found across the country. HH Prime features a number of bone-in steaks: the classic ribeye, the Kansas City cut and soon to be added a bone-in filet mignon. The HH Prime Bar features an open-air, retractable wall. Sip an extra dry martini and enjoy the sunset hues of the ocean. HH Prime's wine selection offers a list of unique trendy blends as well as the classic favorites. Hugo Arrieta, formerly of Fitzgerald's Restaurant for 28 years, welcomes you to a unique yet familiar dining experience. Hugo is pleased to present to you his personal favorites prepared fresh daily and cooked to perfection. With only the freshest meats, seafood and vegetables available, Hugo continues an island tradition of elegance and fine dining in a casual and comfortable atmosphere. Browse the menu for some of your old favorites and instant classics, including fine wines and exciting new menu items. Hugo hopes you will enjoy and looks forward to seeing old friends and meeting new ones in serving all of you again for years to come. Starting with the Antipasti, through the Zuppe, Carne, Pesce ~~ whatever you order here is made from scratch with the freshest available products. Chef Eddy prepares everything served with the greatest of care and passion for taste and flavor and respect for Italian culture and tradition. The pizza is cooked in a Hard Wood Burning oven imported from Modena, Italy. Enjoy the unique taste of genuine Greek cuisine, from gyros to fried calamari to Souvlaki to baklava for dessert. Food is prepared by authentic Greek coos using "only the best ingredients and equipment" including, we are told, the only gyro machines on Hilton Head Island. Everything "is made on the premises, from scratch. The Southeast's Premier Jazz Club & Restaurant. Welcome to The Jazz Corner, the South East's premier jazz club and restaurant offering smooth and elegant jazz with gourmet dining in an intimate and relaxed environment nightly and have continued to offer a unique experience to those who cherish great jazz mixed with fine dining and outstanding service in an elegant environment. Kurama is Hilton Head Island's family-friendly restaurant that specializes in complete dinners prepared at your Teppanyaki table by our well-trained Master Chefs. Kurama features a lively sushi bar, as well as a cocktail bar with TVs for those who enjoy watching sports while they dine. We appeal to a variety of guests from young children and business professionals to singles and couples, and beyond. Kurama also offers the perfect setting for special events, such as birthday celebrations and office parties, and we can accommodate groups large and small. Kurama restaurant certificates make a perfect gift, whether for dining in or taking out. Indulge your palate, while enjoying a memorable and entertaining hibachi experience! Voted Hilton Head Island's Best Seafood Restaurant 2005, Island's favorite Chef 2005 and Best of the Lowcountry 2004. Marleys Island Grille Features a casual, upbeat fun tropical environment. Marleys Island Grille is passionate about serving only the freshest wood-fire grilled seafood and steaks in a casual tropical setting. Our full bar offers refreshing margaritas, house-made sangria and a tropical rainbow of frozen libations. Marleys Island Grille serves a sunset dining menu seven days a week and great happy hour offers. Take-out and kid's menu available. Outdoor dining available and reservations are accepted from September-April. After dinner, do a little shopping and enjoy dessert next door at Marleys Ice Cream & Trading Company. A fun lively and casual restaurant offering fresh made pizza, hoagies, salads and appetizers. Mellow Mushroom features a full service bar specializing in 105 cold frosty beers. Dine In, Take Out and Catering available. Michael Anthony' s Cucina Italiana offers classic fine dining Italian cuisine prepared with a creative touch, presented with a contemporary flair and served in casual and comfortable warm surroundings. Enjoy homemade gnocchi, succulent veal dishes and the creative fresh fish preparations offered nightly. Tempting desserts are made in-house daily and include Hilton Head Island's favorite "chocolate souffle cake." The versatile wine list offers a broad selection by sampler flights, glass and bottle, designed to satisfy the novice or seasoned enthusiast. The cozy wine bar provides just the right atmosphere to enjoy a cocktail, a special bottle of wine or one of our signature appetizers or desserts. You can also enjoy dinner at the bar where the full menu is offered and a reservation is not required. A Hilton Head restaurant not to be missed. Perched high above the banks of the scenic intracoastal waterway, Old Fort Pub offers unrivaled sunsets framed by moss-draped live oaks and a rich history. Renowned for Chef Keith Josefiak's culinary excellence, enjoy friendly service and Contemporary American Cuisine with a Southern twist while dining surrounded by windows and the spectacular view of Skull Creek and Pinckney Island. Situated on Broad Creek, the Old Oyster Factory is a delight for family and children of all ages. Enjoy superb, innovative seafood and steaks while taking in one of the Lowland's best panoramic views of the marshland landscape. Waterfront, at the base of the Harbour Town Lighthouse, is the legendary Quarterdeck, an island tradition for decades. 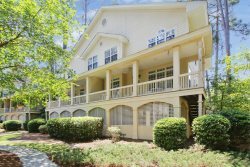 There isn't a more spectacular view on Hilton Head Island than at this marina veranda, where the sights of the moored yachts, the 18th green of Harbour Town Golf Links and the sparkling waters of Calibogue Sound can all be enjoyed. Featuring an extensive menu, the Quarterdeck is the perfect restaurant for lunch. Enjoy mouth-watering Angus burgers, sandwiches like the Lump Crabcake Sandwich on a griddled club roll (a house specialty), salads such as the Honey-Ancho Grilled Salmon salad or Caesar Flatbread salad, grilled paninis such as the Yachter's "Pressed" Reuben, and so much more. Red Fish specializes in cuisine where a blend of house-made spices, tropical fruits and vegetables are combined with Lowcountry specialties and we are committed to serving our guests the freshest ingredients possible. This Hilton Head restaurant has an extensive wine list; and diners may also browse the on-site wine shop which boasts more than 1,000 bottles to choose from. Voted Best Wine Selection, Favorite Restaurant for Lunch, Best Burger and Favorite Caterer by the readers of Hilton Head Monthly Magazine in 2008 and Best Wine Selection and Favorite Restaurant for Lunch in 2009! Wine Spectator "Best of Award of Excellence" 2003 - 2009. At this fun Mexican restaurant, patrons may enjoy live entertainment and a view of the water from the outdoor bar. San Miguel's is famous for their margaritas, best with an order of guacamole or chili con queso. The sirloin chimichanga, chili burrito, shrimp Veracruz, and enchiladas verdes are among the tempting dinner options. One of the favorite restaurants on Hilton head Island. Santa Fe Cafe captures the spirit of New Mexico. Dine in the warmth of white washed adobe walls, fireplaces, vigas and Bancos. Its elegant yet casual, cozy atmosphere exudes a charming backdrop for the authentic yet innovative southwestern cuisine. For over twenty years, Scott's Fish Market waterfront restaurant and bar has served friends and families seafood to fit every taste from - mild to wild. Marina- front at Shelter Cove Harbour, to the right of Neptune's statue, Scott's maintains a fresh approach to seafood preparation. The comfortable Caribbean atmosphere and unrivaled waterfront setting is complemented by energetic service. The restaurant offers water views from every table indoors, the largest outside dining area on the island, all overlooking the boats and the colorful waterfront sunsets. We specialize in the freshest local seafood, hand cut aged steaks, homemade pastas, tantalizing desserts, and a selective wine list and drink menu. Sea Shack serves up one of the Island's most extensive menus of seafood served lots of ways, including grilled, blackened, fried, etc. Its many long-time customers have great affection for its unassuming down-home premises. The Sea Shack, was featured on the Food Networks, Rachael Ray's $40 A Day. Hilton Head Island's newest landmark, waterfront dining destination is Skull Creek Boathouse. Located on the waterfront of Skull Creek, you'll enjoy beautiful views whether you choose to dine indoors on fresh seafood and American favorites with a twist, at the Dive Bar - a raw bar featuring fresh sushi, oysters and more - or dine outdoors on the terrace. The open-air Buoy Bar serves up colorful sunset views daily and the freshest original drinks. The Smokehouse has been serving up its famous, award-winning barbeque on Hilton Head Island since 1999; first from its Coligny Circle location, and now from a beautiful new location situated off Palmetto Bay Road. We offer a diverse lunch and dinner menu, including many specialties, such as our barbeque, ribs, wings and chili, as well as a terrific happy hour. Our main dining room features a 30-foot retractable window wall that allows ample fresh air to circulate throughout the restaurant. You can also enjoy our generous outdoor deck and inviting fireplace on cool Lowcountry evenings. Refresh at our full-service bar with one of our 12 cold draft beers, or a cocktail. The Smokehouse is equipped with 15 televisions, indoors and out, to ensure that our valued guests can catch all the live games.Our personalized service, outstanding food and appealing atmosphere are guaranteed to make your dining experience a fun and memorable one. We look forward to seeing you at The Smokehouse soon! Stellini, known by many as "the Island's little secret," is one of the Island's oldest Italian restaurants, with the same owners and management since 1989. Choose from their delicious pasta, poultry, veal, seafood or beef, all expertly prepared in flavorful sauces. Guests may dine either in th main dining room or in the Carolina Room, overlooking the Shipyard Golf Course. Street Meet is a family tavern and restaurant. Indoor/outdoor seating are available and dining at the bar is encouraged. If you like good food and cold drinks in a family friendly environment, you will love Street Meet: The American Tavern. Here and there we say we have found a hidden gem, but Sunset Grille, owned and run by Hugh and Linda Lockman, truly qualifies. They don't advertise at all, yet are highly frequented by those in the know, even though their charming place with one of the Island's great views! The Sunset Grille is located on Skull Creek with a million dollar view of the Pinckney Island Nature Preserve. It has a great western view with stunning sunsets over the water. The food is superb, the service excellent, and the atmosphere is casual. The Sunday brunch receives rave reviews, so whenever you go, be sure to make reservations. It's off the main road, but well worth the effort to find. Entice your senses while you dine in our fine art gallery. Embrace the feeling of creativity. Have an opportunity to View original works of art by Lunonia Colella and guest artists,before being presented with aromas and tastes created by Culinary Artist Paul Colella.Embellish your experience further as you Listen to live music, Watch artists create at the easel.Enjoy the warmth and accommodation you would expect from friends and family in our intimate dining rooms. Big Wines. Small Plates. Serious Cocktails. Unique to the island for it's casual yet sophisticated urban feel, WiseGuys has fast become a local see-and-be-seen hot spot! Featuring an award winning Big Wines list of over 150 bottles, with over 50 by the glass, and18 in the Island's first Wine Keeper System yielding the perfect glass of wine! The Small Plates menu at WiseGuys takes cocktail party dining to a new level with fresh local farm to table ingredients as well as incredible international flavors, globally inspired cuisine, and fun and exciting presentations that will exceed your every expectation. The cutting edge Serious Cocktail list lights up the nightlife with unique and original libations that change with the seasons. WiseGuys invites you through the stainless steel doors, into the plush and friendly environment to sample the wines, savor the food, and share our passion! The outstanding design of our new lounge and restaurant, located in the Hilton Oceanfront Resort, is cool, cozy and sophisticated all at the same time. Dark-toned metal stairs and appointments create an elegant framework for the two-story walls covered with a sleek wood veneer. The soft lighting and terra cotta-colored ceiling reflect a warm glow. There's also outdoor seating surrounded by palms and the sounds of the music and the ocean. The fireplaces, both indoors and outside, make this a very popular destination in cooler seasons as well. Tapas Restaurant is the pinnacle of exploratory dining. Every dish on the menu seems to be more delectable than the last. Chef Ardis Matthews has weaved together flavors into what could be called a new art form of food. Tapas Restaurant is the pinnacle of exploratory dining. Every dish on the menu seems to be more delectable than the last. Chef Ardis Matthews has weaved together flavors into what could be called a new art form of food. It is impossible to walk away unsatisfied. Tapas serves small plates, so be sure to order more than one and adventure through Chef Ardis' playground of incomparable taste. Remember to call ahead or reserve to make sure this is space for you at this one of a kind restaurant with unique food, a beautiful bar, and a great atmosphere. So get up and go! It's time for Tapas.